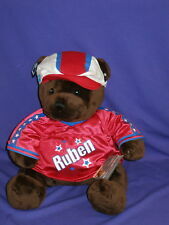 Ruben Studdard American Idol Plush Bear by Applause 12"
Applause Little Beggar Bear Wallace Berrie Vintage 1984 Brown Stuffed Animal 7"
Applause measures approx. 6" long x 4.5" tall. A plush beanbag. Light purple and cream colored. Paper swing & tush tags are attached. Made by. It is in being sold in very good used condition. He measures approx. 4" long x 4.5" tall. Made by Applause. A plush with Magnets in Ears. It is in being sold in very good used condition. There are no holes or stains. Item #62319 tush tags are attached. Applause collection #3 5 of 6 measures approx. 6" long x 4.5" tall. A plush beanbag. Light blue and pink colored fur. It has been played with and does shows some signs of use. 1988 Applause Sad Sam friend Winter Honey Plush Dog with skis & santa hat 11"
Applause measures approx. 11" tall. Paper swing, plastic applause and tush tags are attached. A plush. Dated 1988. It is based on weight. Applause dated 1987 measures approx. 9" tall. Blue Plastic Applause and tush tags are attached. A Vintage Plush. Be sure and have a look at my other PVC toys. Item # 21118 made by. A plush beanbag. Applause measures approx. 6" long x 4" tall. It is in being sold in very good used condition. There are no holes or stains. Tush tag is attached. For Sale. Shows visible wash/play wear, missing fabric on it's nose and sticker is missing from inside the locket. 1992 Applause green dinosaur stuffed animal - Approx. If you aren't familiar with these Applause dinosaurs, they are not soft and cuddly. The are stuffed, but they are on the hard side. Sweet Bryon The Rabbit With Sad Eyes. 1987 Applause Avanti Plush. Himalayan Kitty. About 21” long. My goal is to make you happy, and I try to describe as best as possible. VINTAGE APPLAUSE SESAME STREET BLUE COOKIE MONSTER PLUSH STUFFED 12"
This listing is for a brand new 6-1/2" tall, 7" long 2003 Applause Legally Blonde 2: Red White & Blonde plush Bruiser the chihuahua doll with toy pet carrier! Please see our photos for best assessment, and feel free to ask any questions you may have before making your purchase. Tyrannosaurus Rex. RED/ORANGE T-REX DINOSAUR 7" SOFT Plush Toy. USED AND IN VERY GOOD CONDITION. This is aPurple Hippo Stuffed Animal with Valentine Hearts Headband - Applause made for Necco Sweethearts - 10" H. The hippo also has Valentine hearts on its left foot that are embroidered in pink. It holds a pink felt cover that is made to hold a small square box of Valentine heart candy. New adorable chummy teddy bear. Made in 1992 by Applause Toys. Excellent Condition Magic Glow Friends Puppy Dog Plush Stuffed Toy. This puppy dog is in excellent condition! No tears, holes or stains. White Plush Fur with Long Purple Hair on Head. 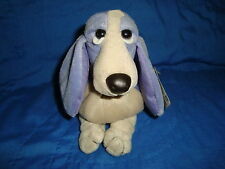 Applause Plush Sad Sam Puppy Dog Blue Bird Stuffed Beanbag Small Vintage 6"
Made by Applause. Sad Sam plush puppy dog. Has a little blue bird sitting on his foot. Vintage Applause Brontosaurus Green Dinosaur Jumbo Aptosaurus Stuffed Toy 18"
My son has Asthma & I would never put another child at risk for an attack. Great used condition: Has a light flaw or more than a little piling, wash wear, fading, etc. Good Used condition: Has a major flaw, very used, lots of piling, wash wear, fading, etc. 1985 Applause Kennel Pup Puppy Dog Plush 10" Long - great played with condition, light play wear. VINTAGE 1987 GUND teddy bear Limited Edition B. Altman's moveable joints. 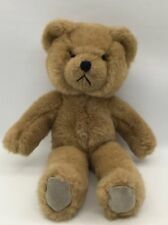 VINTAGE 1987 GUND teddy bear Limited Edition B. Altman's moveable joints Great condition. I believe its missing the bow tie. I tried to provide as many pictures as possible but can send more as requested. Please ask any questions or concerns prior to purchase. Applause plush Princess Paw Paws dated 1985. Quite a few on the right one. Plush dragon is about 9.5". Fred and Ethel Bears. Plush/ Stuffed Animals. Set of two bears. Applause NECCO SWEETHEARTS CANDY Purple Plush Lady Hippo Stuffed Animal Toy 2007 8". Very hard to find promotional item. It is a collaboration between Necco & Applause. She is just TOO adorable for words. This is a vintage 14 inch tall 1985 Precious Moments Applause stuffed, plush Hilda Goose. This is in used, but very good condition from a non-smoking environment. Blue Pink Yellow Spinosaurus 23.5" LONG. - Green Pink Orange Brontosaurus 18" TALL. Here we have a 1992 Applause Stuffed Dinosaur Lot. Both Dinos are the large size Versions. 1989 Applause Jane Goodall Plush Chimpanzee Plush. 1985 Applause Avanti Spaniel Sitting Up 13”. Condition is Used. Shipped with USPS Priority Mail. Condition is Used. Smoke and Pet Free!